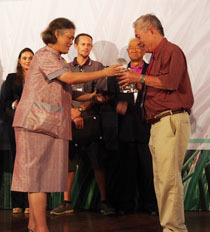 Paul Truong of Australia receives (left) Global Vetiver Champion Award from TVNI's Patron, Her Royal Highness Maha Chakri Sirindhorn for, for 25 years service to the Development of the Vetiver Grass Technology with special reference to his work on the development of Vetiver Grass Technology for the decontamination of land and water; and for his mentoring and support to many young post graduate students working on vetiver as part of their thesis. Other awards and certificates were presented to the recipients by Her Royal Highness at ICV6 at Da Nang, Vietnam. Alain Ndona of the Democratic Republic of the Congo awarded Vetiver Champion Award for the introduction and dissemination of the Vetiver Grass Technology in Congo Kinshasha and Congo Brazzaville with specific reference to slope stabilization. Alois Kennerknecht of Peru awarded the Nick Dolphin Award (US$ 750) for the communal application of the Vetiver Sytem in urban areas of Lima, Peru. Luu Thai Danh of Vietnam awarded the Mark Dafforn Award (US$ 1,500) for his comprehensive review and compilation of Vetiver Grass Technology application for phytoremediation. Kittima Sivaarthitkul of Thailand and her colleagues of the Land Development Department awarded the Monty Yudelman Award (US$ 2,500) for developing Vetiver Grass Tracking System for Thailand. Other TVNI awards can be found at this page.